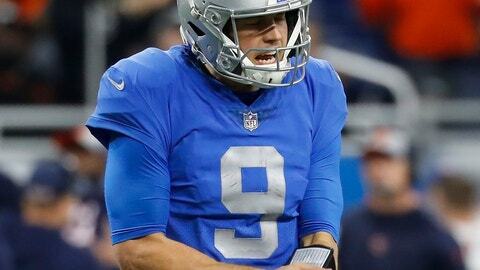 DETROIT (AP) — Long before Matthew Stafford’s two interceptions in the fourth quarter, the Detroit Lions looked limited offensively. Playing without running back Kerryon Johnson and wide receiver Marvin Jones, the Lions kept it close against Chicago on Thursday but ultimately fell 23-16 . Stafford’s late interceptions turned the game in the Bears’ favor, but even when Detroit was keeping better care of the ball, the Lions weren’t exactly picking up huge chunks of yardage. Detroit has some extra time to rest now, and perhaps the Lions will be healthier for their next game — but that Dec. 2 matchup is against a formidable opponent in the Los Angeles Rams. The Lions (4-7) already have as many losses as they had all of last season, when they went 9-7 before firing coach Jim Caldwell and replacing him with Patricia. It has been a struggle in 2018: The team started 0-2, battled back to 3-3, then lost three straight. Detroit was 3-4 when it traded receiver Golden Tate to the Eagles. Now Jones has been dealing with a knee injury, further hampering the passing game. Receiver Kenny Golladay looks like he could be developing into a star, but against the Bears he seemed like Detroit’s only big-play threat. Stafford finished 28 of 38 for 236 yards in the Thanksgiving loss to Chicago. It was the third time in four games he averaged under 10 yards per completion. He indicated afterward that the Lions prioritized quick passes to deal with Chicago’s pass rush. With the score tied at 16, Stafford threw an interception that was run back for a touchdown. Then he had a pass picked off in the end zone with just over a minute to play. Both Jones and Johnson were out with knee injuries. Johnson, a rookie, has given Detroit’s running game a boost, but even with him out, the Lions were able to move the ball decently on the ground. LeGarrette Blount ran for a season-high 88 yards with two touchdowns. NOTES: The Lions announced Friday that they have been assigned CB Marcus Cooper via waivers from the Bears. Detroit waived S Don Carey. … Although injuries made the going tougher on offense, the Lions had reason to be encouraged by DE Ziggy Ansah’s performance. Ansah has dealt with injury problems of his own this year, but he was a factor Thursday with a sack and two hurries.